Internet Download Manager for Windows XP - file download manager via http and ftp connections. The application contains extensions for most modern browsers, has a customizable interface, runs in the background and supports proxy. The utility uses the built-in task scheduler, defines redirects and mirrors. The program can operate in multi-threaded mode, can intercept downloads and form a download queue, can automatically sort files, consumes a small amount of RAM, and can download multimedia data from popular media services. 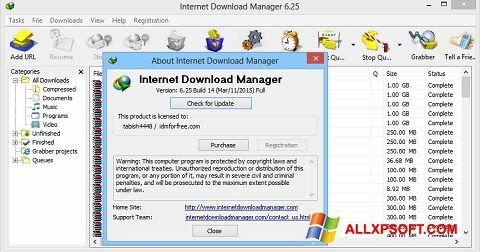 You can free download Internet Download Manager official latest version for Windows XP in English.